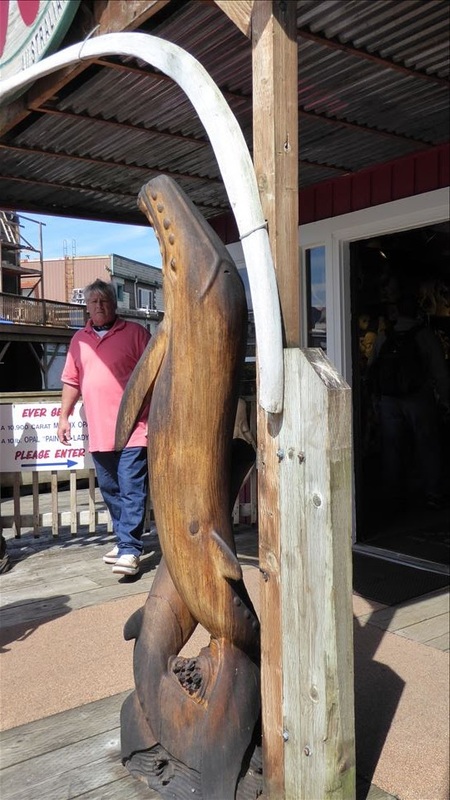 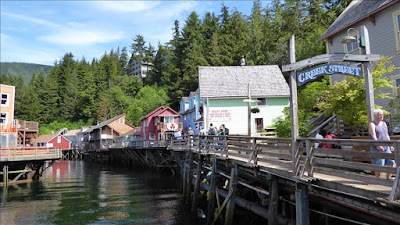 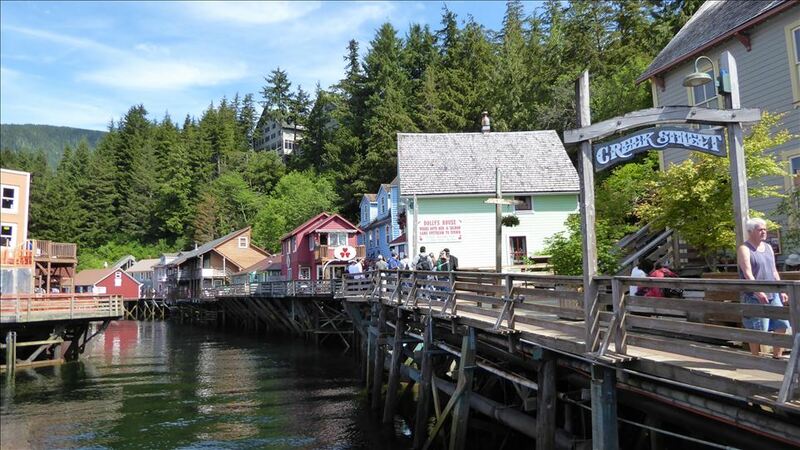 Ketchikan in the south east of Alaska is known as the ‘Salmon Capital of the World’. 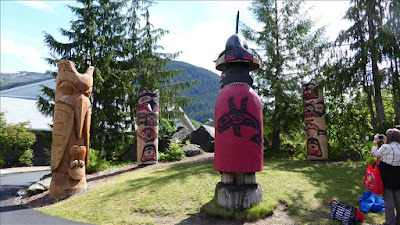 It is in the heart of 17 million acres of Tongass National Forest, the largest in the United States and its heritage is linked to the Tlingt, Haida and Tsimshian tribes of Alaska. 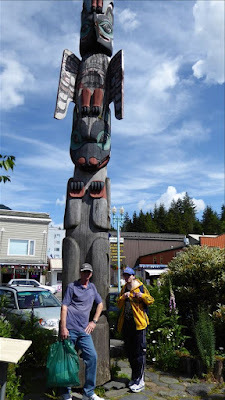 It has the largest collection of totem poles. 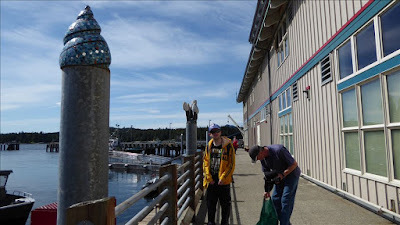 on the docks and picked up a free walking guide. 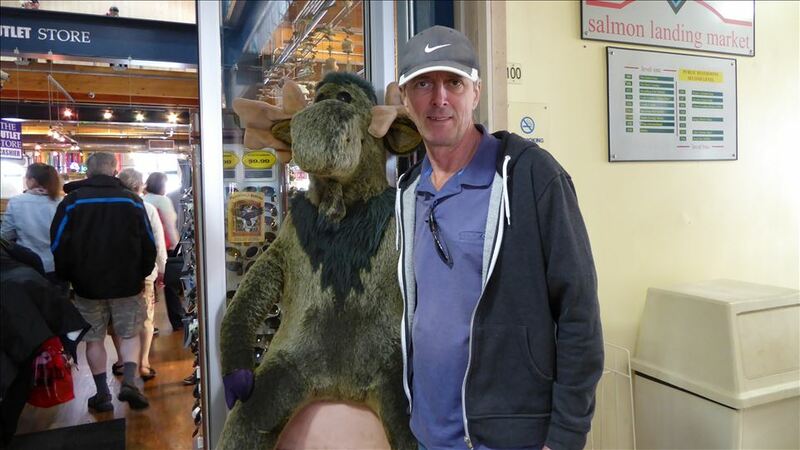 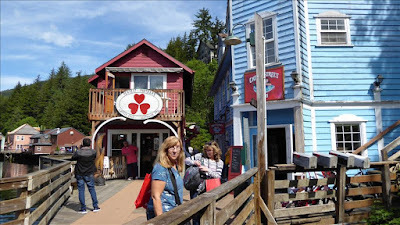 There are very many touristy gift shops and food outlets. 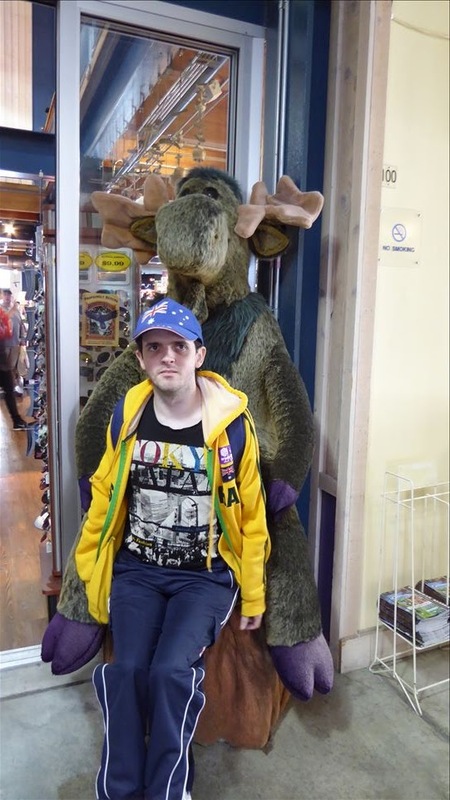 We went into a couple. 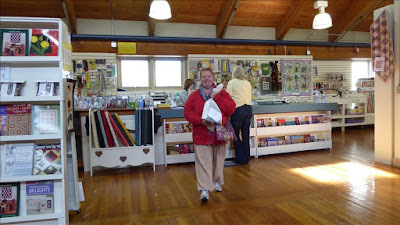 ... And then we found the quilt shop at Salmon Landing Market place. 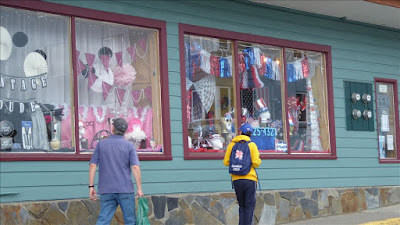 Like all good quilt stores, there were seats outside for the husbands to sit on. 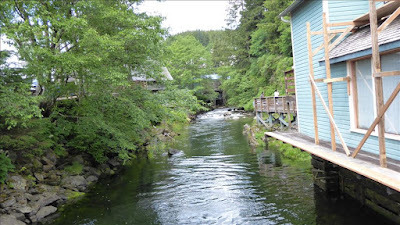 and up towards Creek Street. 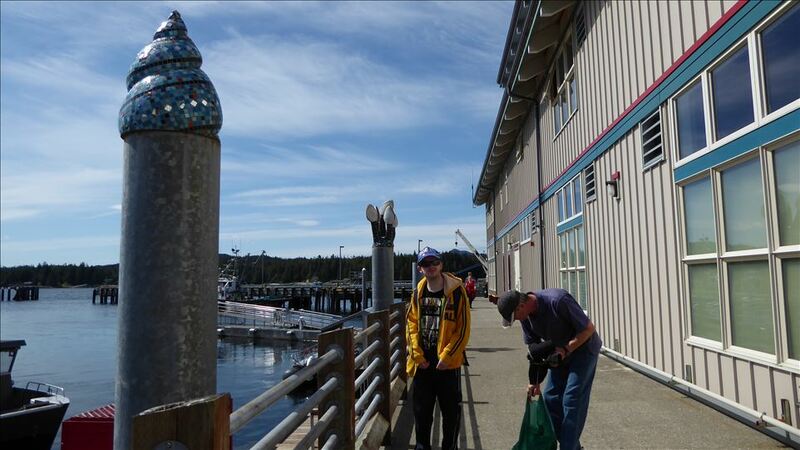 We were expecting cold weather, but the weather was beautiful. 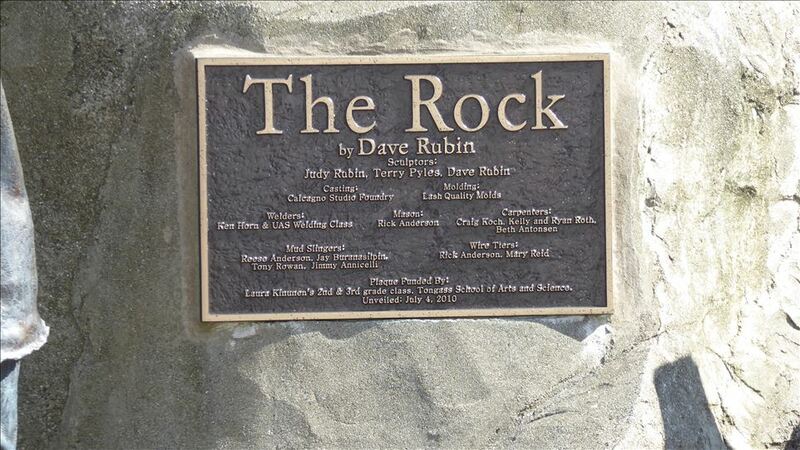 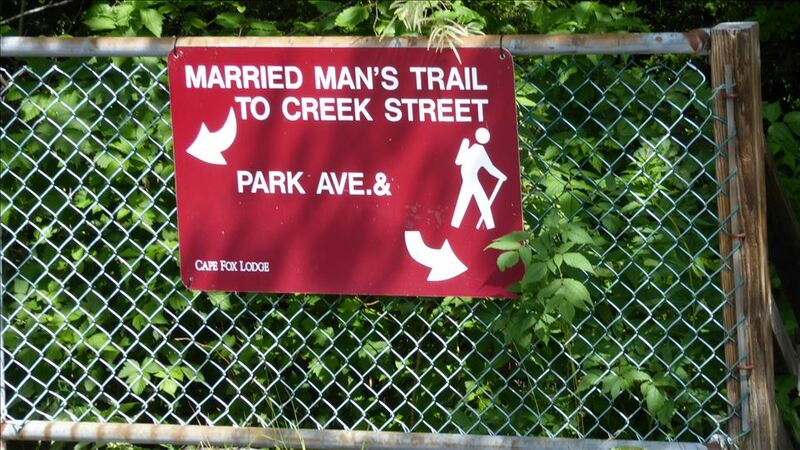 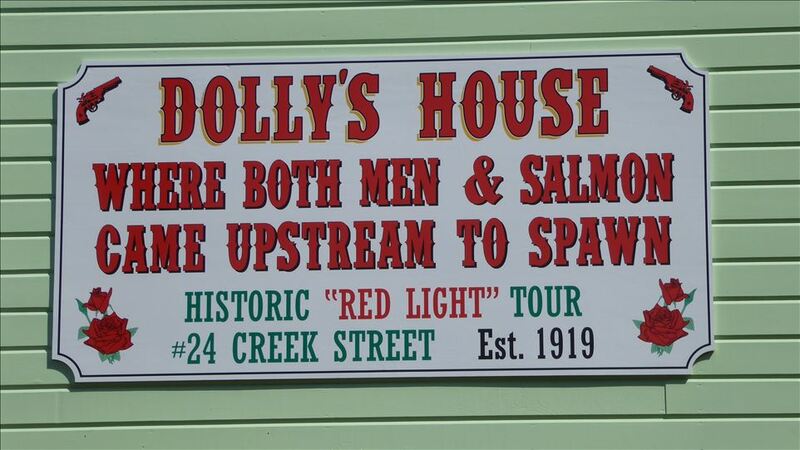 which is more like a boardwalk, reading all the historic plaques. 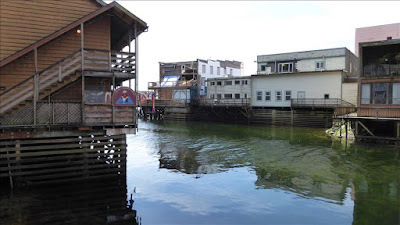 This area was where the local brothels and bars were located. 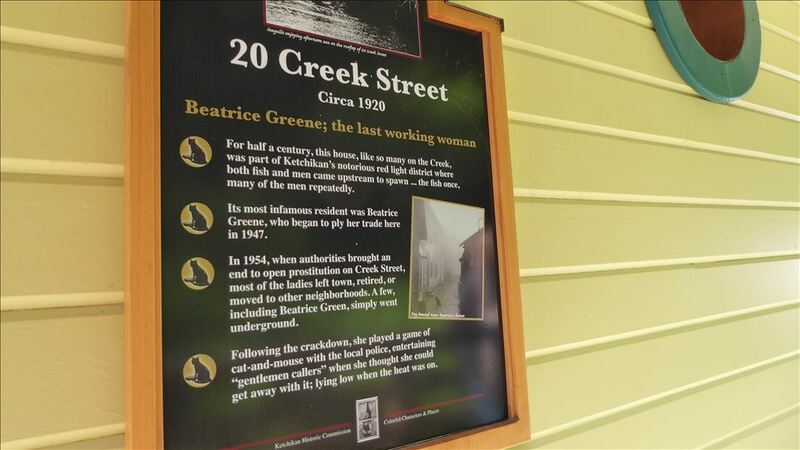 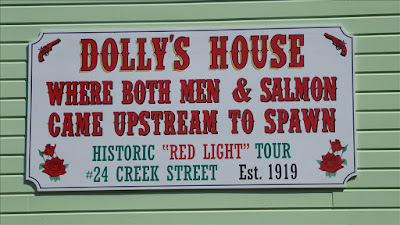 on our walking tour brochure, gave us a good background to this historic area. 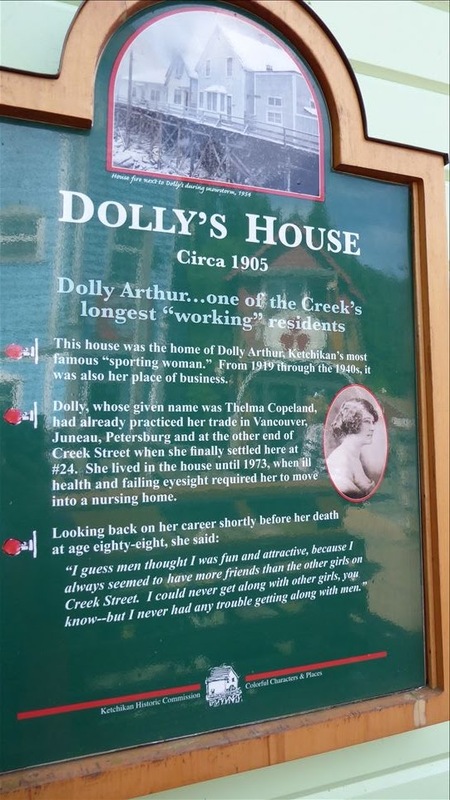 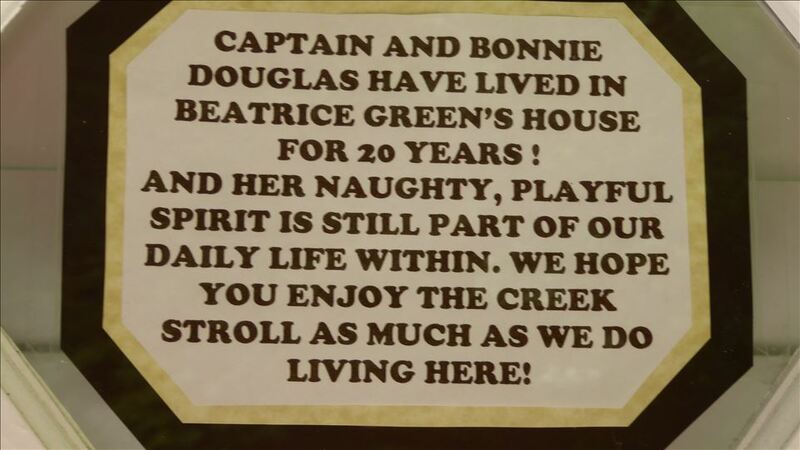 Dolly's house is now a museum that one can walk though at a cost. We found an Australian connection in Creek Street. 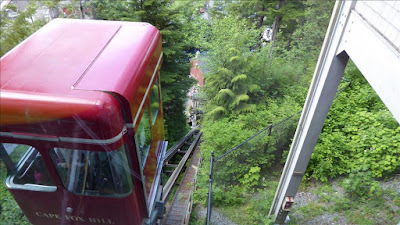 we came across a $2 cable car ride up the hill, so we did it! 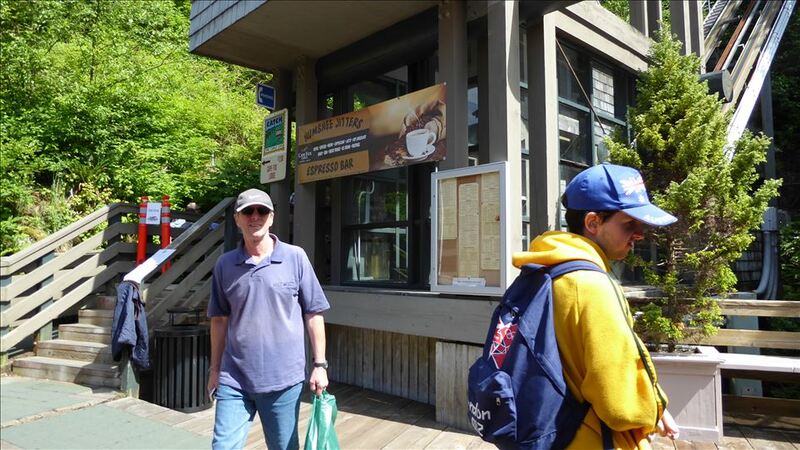 It was a short ride, and at the top is a lodge with a small cafe. 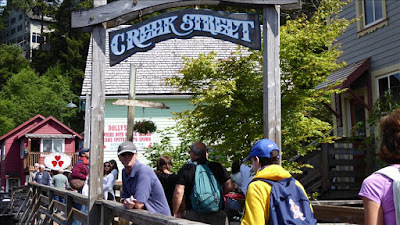 and a pathway back down the hill to Creek Street. 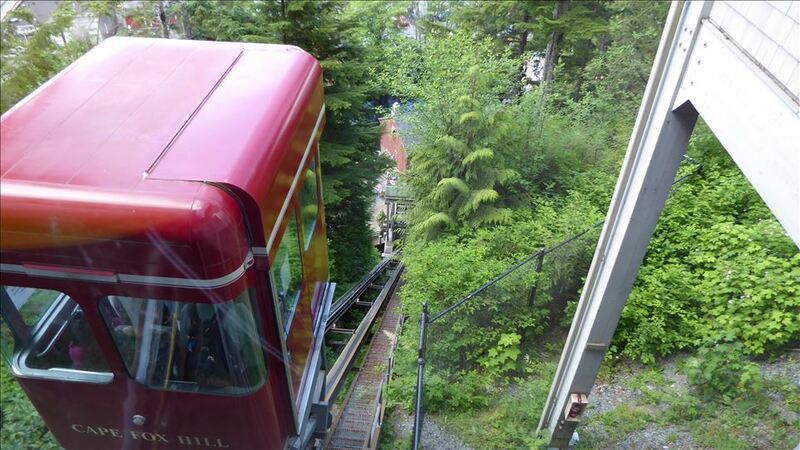 We took the cable car. 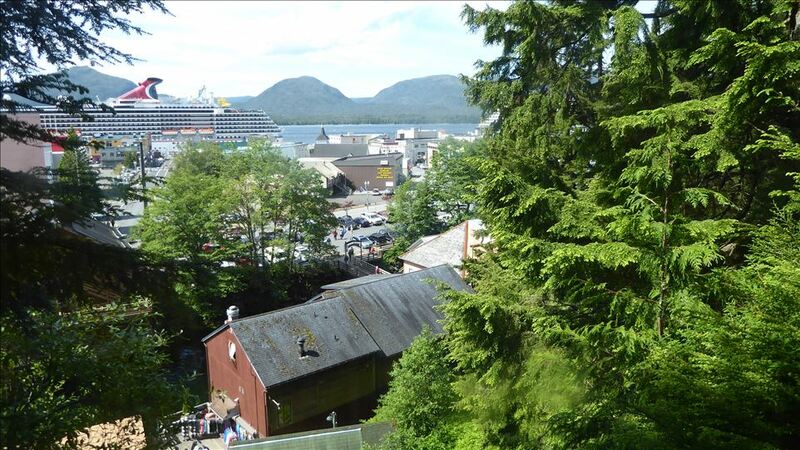 View of our ship from the cable car. 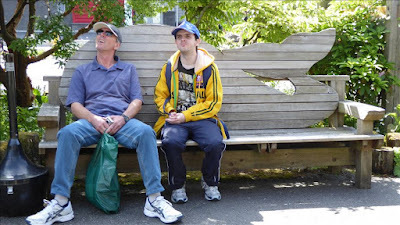 Having a rest before walking around some more streets. 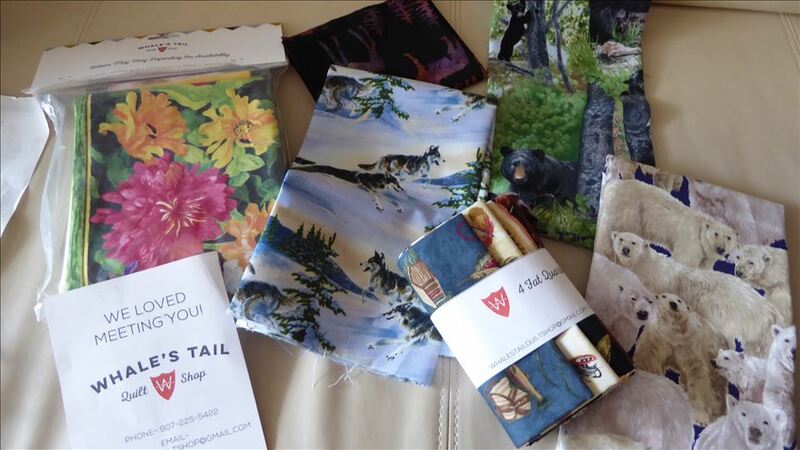 Fabric I bought at the Whale's Tail. 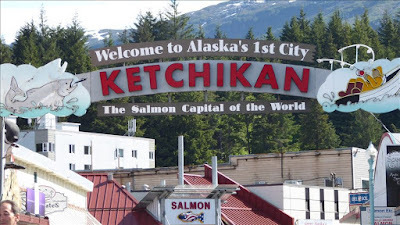 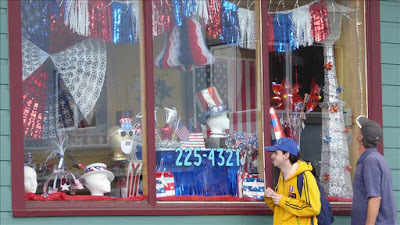 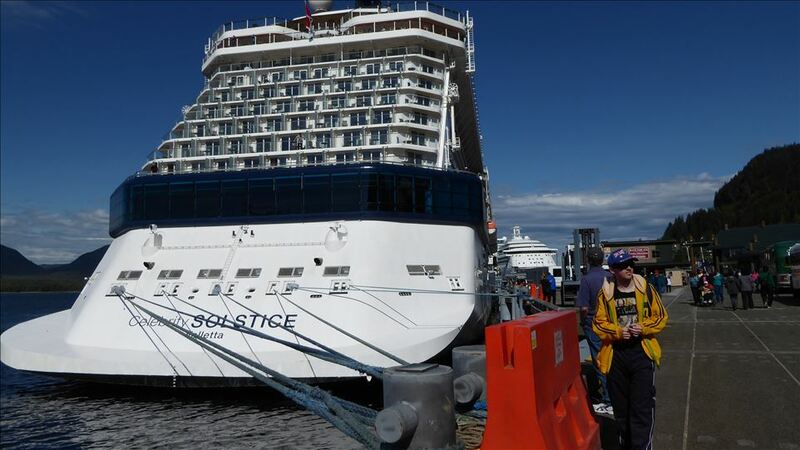 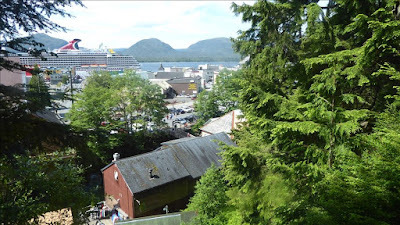 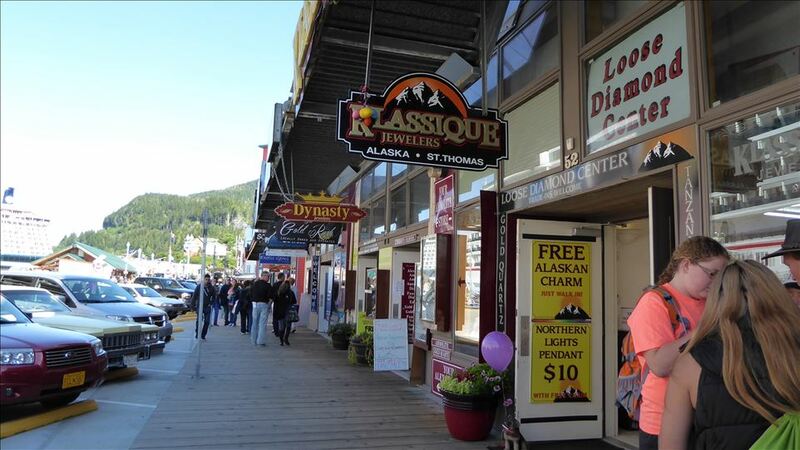 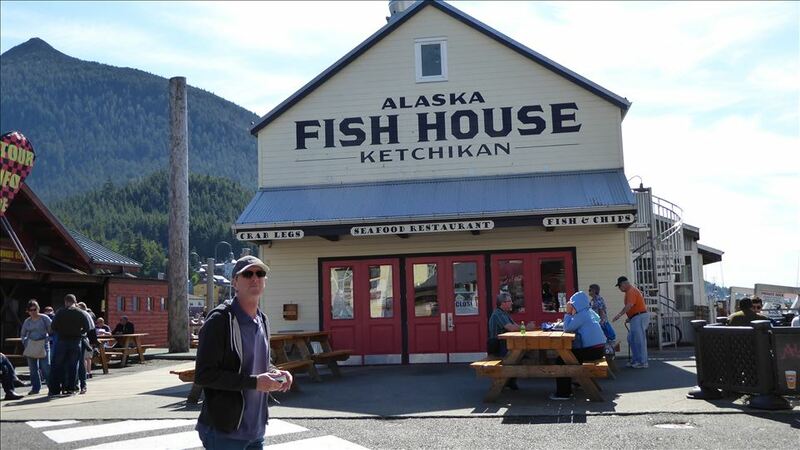 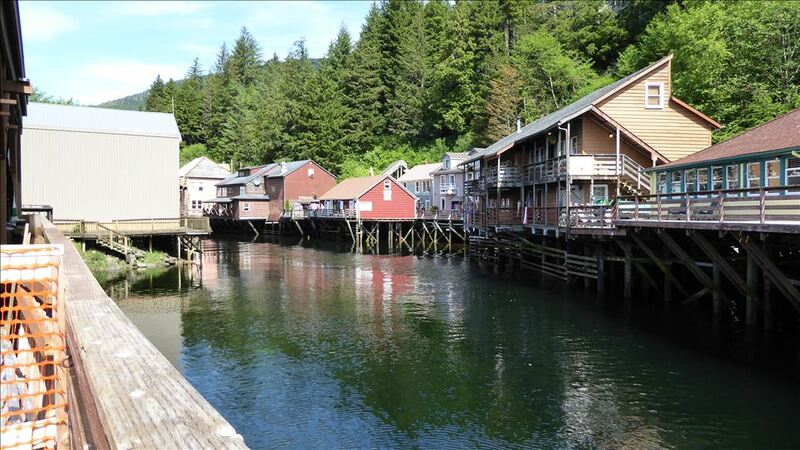 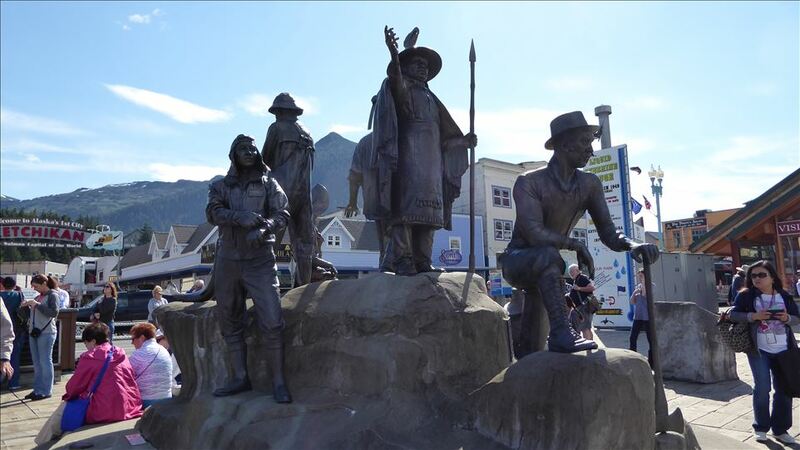 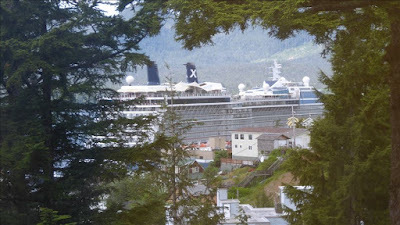 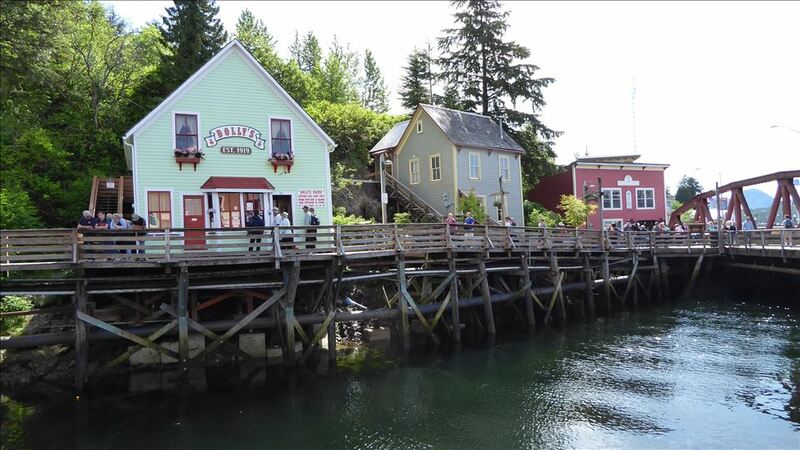 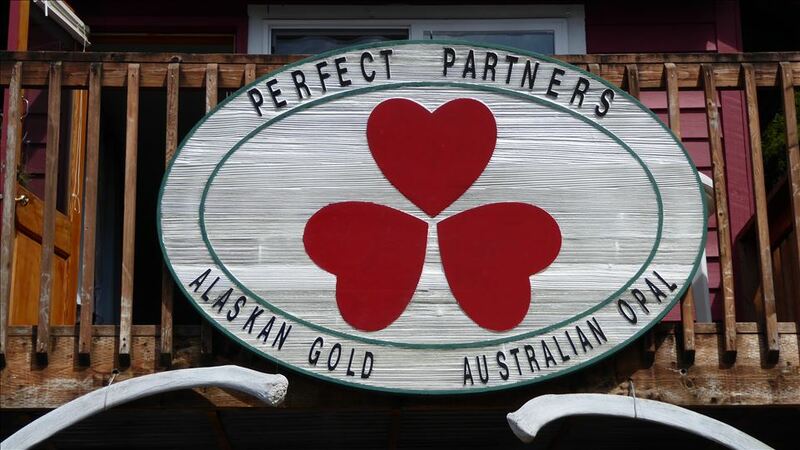 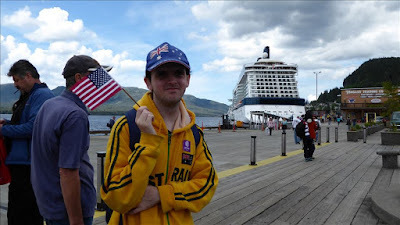 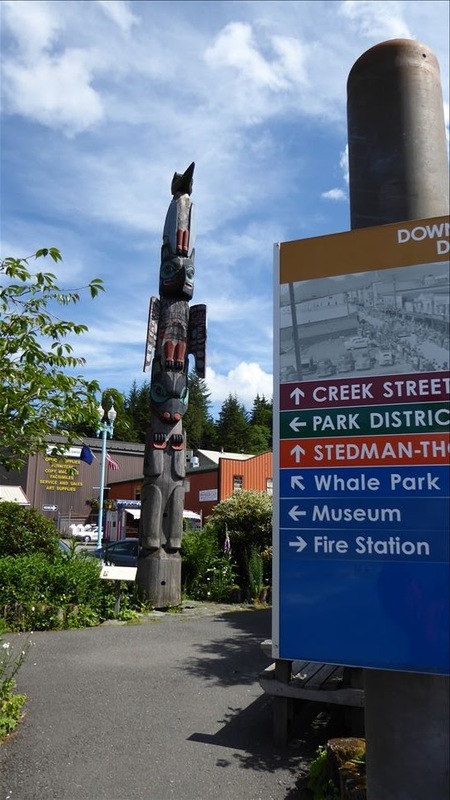 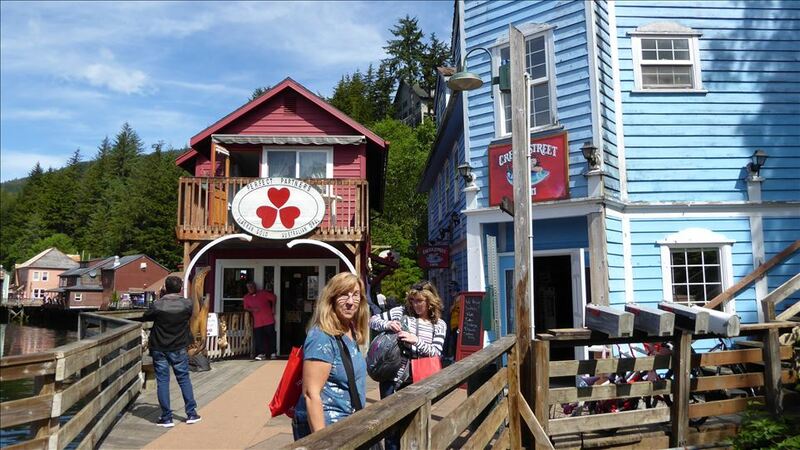 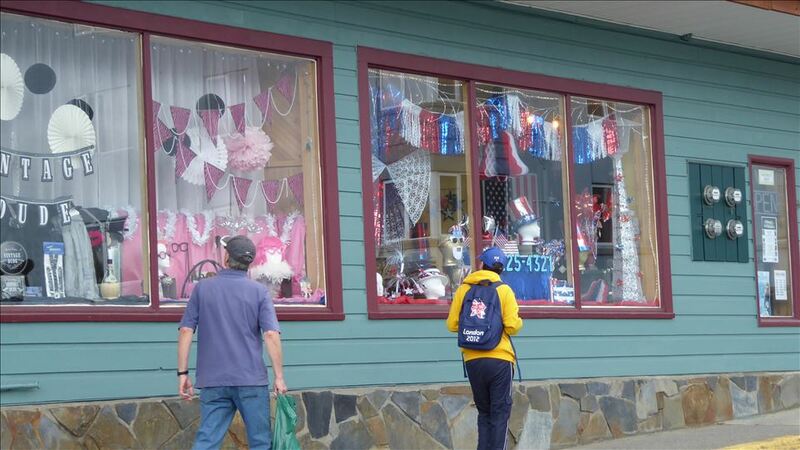 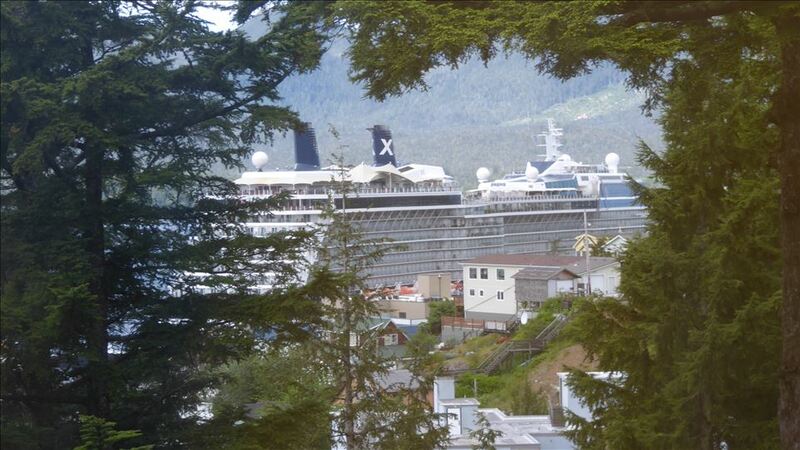 Find out more about Ketchikan here. 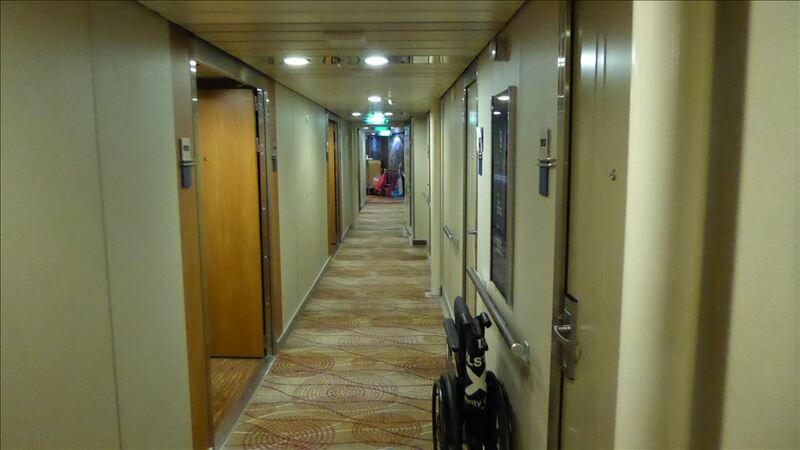 Looks like a great cruise - how wonderful. 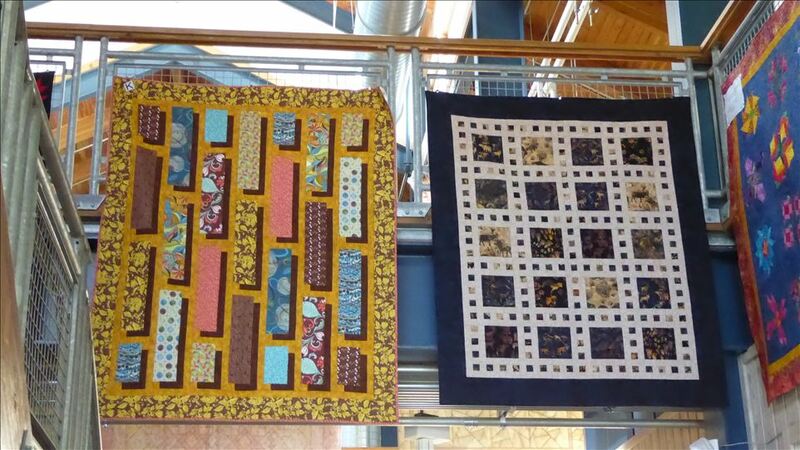 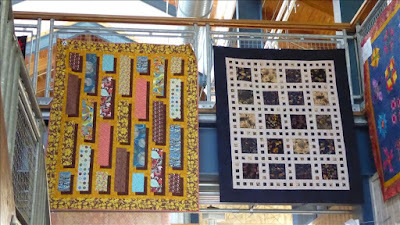 And you were so very clever to stumble across a quilt shop in your travels!